Dr. David Fishkin, founder of the Dry Needling Institute, has built a reputation as an innovative, expert clinician and educator in the use of dry needling as a chiropractic and manual-medicine treatment modality, and is recognized by the American Chiropractic Association (ACA). The Dry Needling Institute conducts intensive training that drills down to the most critical, practical applications for the front line practitioner. You’ll complete the course a competent, confident and certified practitioner. Why Choose the Dry Needling Institute? At the Dry Needling Institute we understand and respect the years of education you’ve invested in your training. At the Dry Needling Institute we do not teach you what you have already learned and paid for in your education but give you the additional knowledge and tools necessary to provide Dry Needling services safely and effectively. At the Dry Needling Institute we have developed two training options: a 12 hour, two day dry needling certification program, and an 18 hour, three day dry needling certification class. Both the 12 hour and 18 hour programs will give you all the training necessary to deliver dry needling services safely and effectively in your practice. These courses are built upon the training you have already received in your education as a healthcare professional. Both courses are kept small to ensure competency. 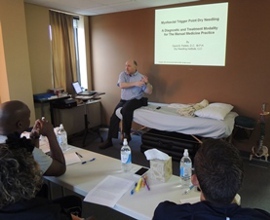 Dr Fishkin is pleased to announce that, due to popular demand, the Dry Needling Institute is offering its 12 hour course Dry Needling class in Connecticut. The course provides 12 credits approved by P.A.C.E. and University of Western States. Dr Fishkin is pleased to announce that, due to popular demand, the Dry Needling Institute is offering sessions of our three day Dry Needling class in Covington KY. The course provides 18 credits approved by P.A.C.E., the Kentucky Board of Chiropractic Examiners and University of Western States. Contact us for information about the program or to register for a course.